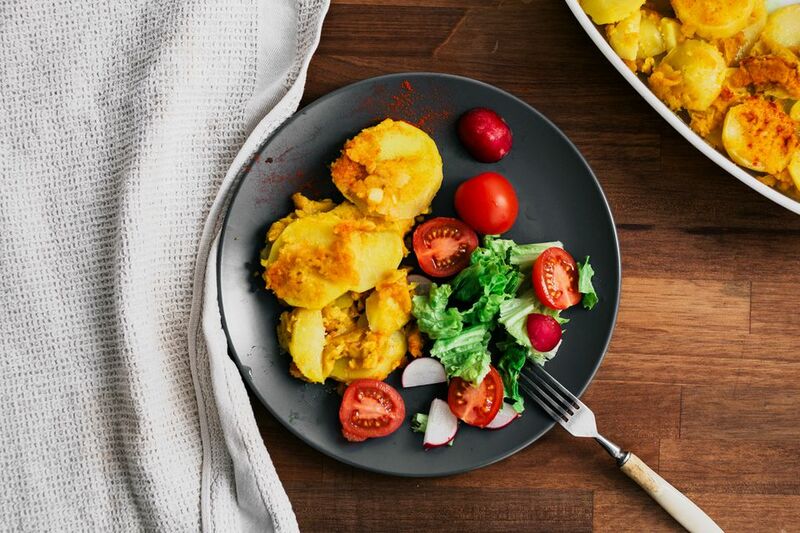 Do you love potatoes au gratin, but need a vegan recipe? This baked potato casserole dish is covered in a rich and creamy cheese sauce that has no dairy ingredients. This vegan version makes a thick dairy-free sauce out of nutritional yeast instead. While there are many brands of vegan cheese on the market, you don't necessarily need them for the gratin in potatoes au gratin. You'll find that nutritional yeast can do the trick as well. If you like this vegan baked potatoes au gratin, you might like this similar recipe for vegan scalloped potatoes. You can also enjoy spicy vegan scalloped potatoes with green chilies as another potato casserole variation for dinner. Bring two pots of water to a boil, one to pre-cook the potato slices (unless you will do that in the microwave instead), and one for boiling water for the sauce. Slice the potatoes about 1/3-inch thick. Drain well, then spread half the potatoes in a casserole dish. In a large skillet, sauté onions and garlic in a tablespoon of olive oil for 3 to 4 minutes. Reduce heat and add vegan margarine and flour, stirring continuously until thickened. Add boiling water, salt, soy sauce, and turmeric, frequently stirring until thickened. Add remaining 1/4 cup olive oil and nutritional yeast, stirring again just until well mixed. Pour half of the sauce mixture over half of the potatoes in the casserole dish. Add a layer of the remaining potatoes. Then cover with the remaining sauce. Then uncover, and bake for an additional 10 to 12 minutes. Remove the casserole from the oven. Sprinkle the top with paprika, if desired. Allow for the potatoes au gratin to cool for 10 minutes before serving, as the sauce will thicken as it cools. Enjoy this dish with a side salad or roasted vegetables.